Førde Gjestehus og Camping has inexpensive conference rooms for hire, suitable for large and small meetings by companies and organisations. Our different conference rooms can accommodate from 20 to 180 delegates. The rooms are equipped with a projector, sound system, conference table, flip chart stand, whiteboard etc. You are welcome to use our kitchen or order catering from one of our local partners. We are of course happy to offer your attendees overnight accommodation should they need it. We can also lay on breakfast for larger groups. Førde Gjestehus og Camping has all the facilities you need for your course or seminar. Be it a one-day course or a multi-day seminar, we have reasonably priced premises available for large and small groups. Get in touch with us for a tailor-made quote. Prices from NOK 95 per person, incl. coffee/tea. Førde Gjestehus og Camping is perfect for awaydays and team-building events. Our partners can offer action-packed activities and adventures while you and your colleagues are staying with us. We provide inexpensive accommodation in comfortable cabins and apartments. Why not make use of our barbecue hut on the banks of the River Jølstra? 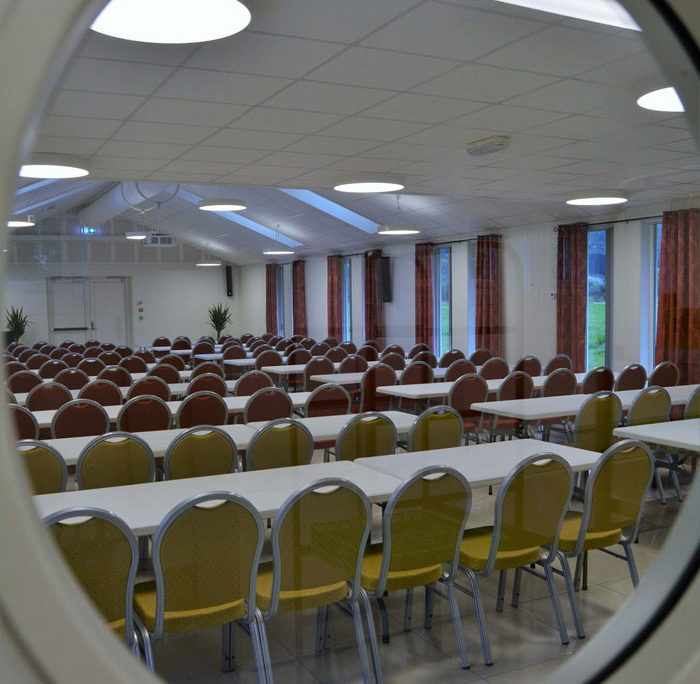 Førde Gjestehus og Camping offers inexpensive meeting facilities and equipment for your board meeting, AGM, club meeting etc. Get in touch with us for a competitive quote. Upstairs conference room: projector, screen, flip chart stand, sound system. Reception room: projector and screen, sound system. “Bjørns lokale”: projector, screen, wireless microphone and lapel mic. Sound system inputs: HDMI, DisplayPort, 3.5 mm line-in, RCA, USB. Free wireless network throughout the premises.